Discussion in 'Regional Championships' started by DreamChaser AJ, Apr 13, 2008. So I wasn't entirely sure that I was gonna make it out to regionals because I'm graduating in 2 weeks and I have a good amount of Finance and Tax homework to do (I'm typing this because my carpool hasn't left yet from my friend's house in Toledo). I was a judge at Ohio States and didn't make it out to Michigan States because of a freak snow-storm. So I really hadn't had any chance to play in a while. Also, I didn't have time to build a cool rogue deck like I love to do because I've been doing Accounting homework the past few weeks at my Green League (I'm always too busy at Norton League) I made it out to Cuyahoga Falls league once to get my rear-end handed to me by Hoolon Mike Collins with his GG deck. I had built a Wormadam deck at league the week before and play tested it at 1am and my friend's apartment in Toledo, only to get stomped by my GG deck, so I decided to just play my GG deck because I hadn't had a deck that I could beat it with. I raised a DS team in case I didn't make top cut so I'd still have something to do. So after sleeping at 4am and getting up at 7am to leave for Indiana, we go. When I arrive in Amish country, I pull out my GG deck. The Cressalia I had never really helped me so I took it out. Also, I wanted to increase the consistency of my build so I took out my windstorms. I figured I could just knock out the pokemon with a cess and use furret to get what I needed. I added 1 bebe's to act as a 5th Celio's and upon my friend Hoolon Mike's suggestion, added a warp point (GREAT idea) I played a Swampert version because I loved what Mondak was able to do with it at Ohio States. Loved the deck, enjoy playing with Jackie. I hadn't played in a while plus a little lack of sleep caused my playing to slow down a little, but I still played in a timely manner. She drops 2 Togekisses because she knows I'm going to lock her. I TGW and lock her, but am taking 50 hits from Salamence. I send up Gallade and flip all of my prizes to KO a Salamence. Then I start the lock again. Time is called and we are tied. We play for another few minutes but I pull out the win eventually! GG! Mirror match! I remember what Drew and Fulop had said before about letting the opponent take the first prize in the mirror match to use the scrambles. Use furret to set up. I win on time, but I still think I would have had it without time, GG! Great. He drove me here, so I didn't want to get him mad at me ^_^; He's a good sport though so it was cool. He had the upper hand at the beginning but I was eventually able to get something going at the end. GG! She was nervous as all heck being 3-0 at this big a tournament. She only had a chance to playtest at leagues so she said she was happy that she made it as far as she did. I started with Furret and got a Gallade set up to win. GG! Congrats on doing so well! I always enjoy playing Liz but our games always are hard fought. I wasn't able to get the lock on in time, and I really don't like my odds against this matchup. She also manages to KO my swampert before I had the chance to do damage with it. Towards the end I needed to play TSD to get something back, but I get 3 tails. She has the game so I look for any possible out I can. Time is called and I was ahead. Sorry Liz! I really hate winning on time, you would have had it for sure after that! GG! I always like playing with Matt, as him and his son Joey often spend time talking strategy with me. We both set up, but he sets up better and beats me. We were both in anyways, so neither of us were too worried. GG Matt! So Top cut comes and I'm ranked 3rd. Hoolon Mike made it as well, Woohoo! Oh how I hate playing magmortar. I luck out that his deck didn't pass deck check and I get a game 1 win. Our actual first game goes a while but I just can't catch up and he OHKOs my Swampert. Game 2 I get my lock early and and get set-up. I know I'll get the game and he picks up. GG Brandon! This guy was great to play with. We were telling jokes the whole time and having a good time. Our first game got close. I mess up and don't attach my double rainbow to Swampert to miss the win. He then misplays by sonic blading my swampert. I draw into my warp point to KO a sentret! Game 2 goes to time since the first game was so close. GG Justin! NOooooooooooooooooooooooooooooooo! I didn't want to play Hoolon! Game one we both start with Furrets. I remember to let him take the first prize so I set up things on the bench. I make him use Alakazam's power even if I didn't need to Telepass (I had furret) to get him to discard things. I eventually win. Game 2 goes and I get scared for a while, but I eventually would have been able to get it even if time hadn't been called. Great Job Hoolon! 4th place at Regionals is no small feat! Great game! Top 2: Eric (psycodad) w/ Absol Houndoom. Everyone tells me that I'm prolly going to lose so I go into the match thinking of playing differently. He has excellent artwork with the coloring on his cards so we have a great time playing. I figure the Cess. Crystal and Crystal beaches were coming. So I set up Swampert and pull out my 2 Lake Boundaries to KO his Houndooms. Game 2 I get my furret and start setting up a gallade with basics and a swampert with DREs, with a furret to get me a stadium if I needed it. He sees no point in drawing the game out and I win! Great Game! Soooo... I won Regionals! Go figure I get scholarship money 2 weeks before I graduate college! Oh well. Great job everyone today! Everything was great! Farber and his crew for a great event! Swampert and warp point for helping out! Being forced to wear a Pikachu costume in the top cut by the Allens. Me playing GG. I would have rather played rogue. Schoolwork for stopping me from playtesting a deck. Winning on time. I don't like doing that. I must say I felt really bad about your T16 round opponent since I'm the one who checked his deck. Mr. Lathem said he made an error in initial deck checks and allowed it to pass. I could not since his deck was not as the actual list said. I'll tell you about it later today.. it put him at a severe disadvantage though. Congratulations though! Team 330 FTW and Ohio players repping! Way to go AJ! 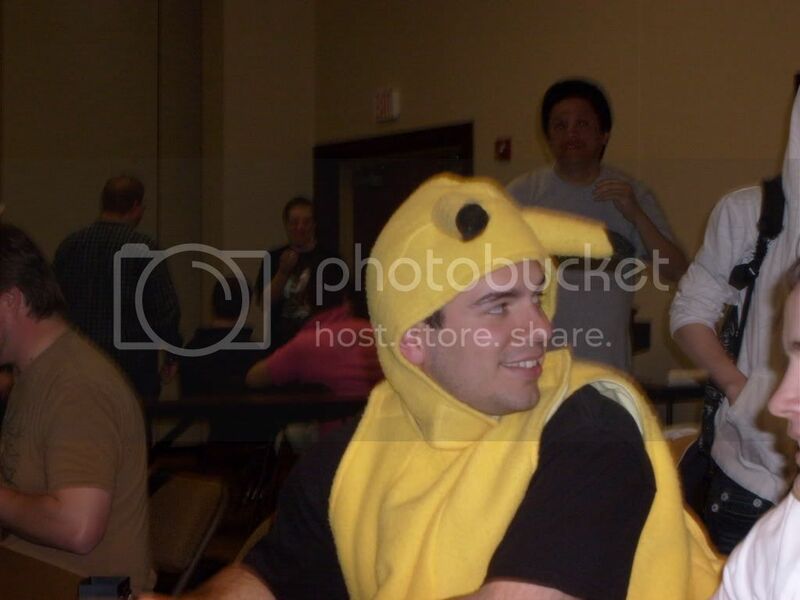 I think the Pikachu costume threw your opponents off guard in top cut. :wink: Great showing against some awesome players. It was great to see Ohio players take 8 of the 12 trophies yesterday! Congrats on the win, AJ! I was really hoping I would have got to play you again in the finals, but Eric's deck just ran me over (great deck Eric!). Congrats on winning AJ!! (Its Dustin, not Justin btw) Atleast now I can say I got knocked out by the winner. :thumb: Those were some fun games we played, it was one of the frst times I didnt mind losing. You killed me in wagers though. Hey AJ! Maybe you can hook a sister up with that scholarship money eh? :thumb: Way to go. Sorry I couldn't join you up there. Your opponent in the top 2 was the one who took me out. Mr. Lathem said he made an error in initial deck checks and allowed it to pass. Great job AJ - you earned it. Whats this doing on the 3rd page?? Thanks for the props and great job winning regionals. It was quite a real laid back set of games, it felt more like testing than the finals of a major. I am surprised people thought you would lose. When I watched your top 4 match I knew I would have issues. Here's why. The GG dooomlock match up comes down to the GG build (you had the right tech and gallade count ), my starter (houndour is a better starter here), and your furreting for the counter gyms. I was unable to discard the stuff I needed to get rid of with the absol start and your well timed wagers ruined me. Super strategy on your part. Oh, now you HAVE to share the photograpic evidence! I have AJ as one of my friends on the Space! Waitaminute.........I still have the pic on my cell phone!!!!!!!! You know Dan, that the Pikachu suit is owned by the Allens. If Mike or Kim would of top cut, then they would of been wearing it! IMO, one of them should wear the next time they judge for me! By the way Dan, I'm a professor-staff for nationals, so I won't be playing. Ouch! Way to throw me under the bus, Steve! Sorry, John. You're still an awesome TO, nonetheless. Everyone has their moments!